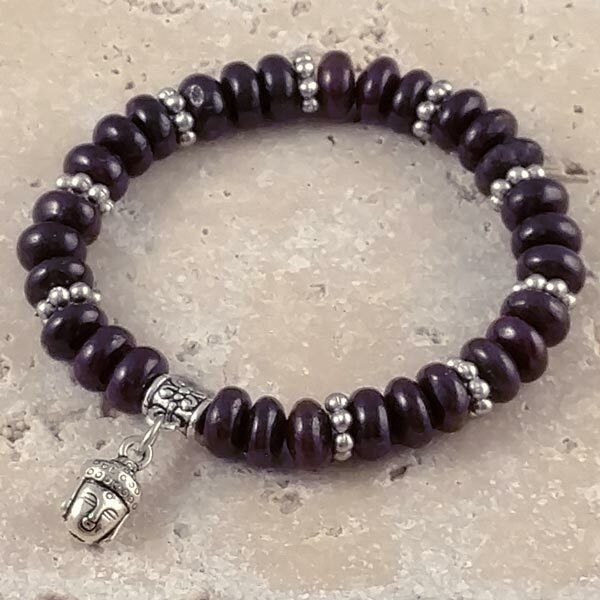 Relaxing Garnet healing bracelet. Choose a Lotus or Buddha Charm. 8mm rondelle beads with fine pewter accent beads. Lotus Blossom charm is approx. 3/4" and Buddha is 1/4" in diameter, and both are fine pewter (no cadmium, nickle or lead). Opens root chakra. Warms, grounds and directs energy into the root center, draws earth energy into the body. Stimulates life force, causes acceptance and balances in incarnation, boosts sexuality and fertility. Repels disharmonious others from your aura energy and draws your harmonious and sexually compatible mate to you. Garnet is a mineral group that can range in color from red, pink, orange, yellow, greenish brown to black. 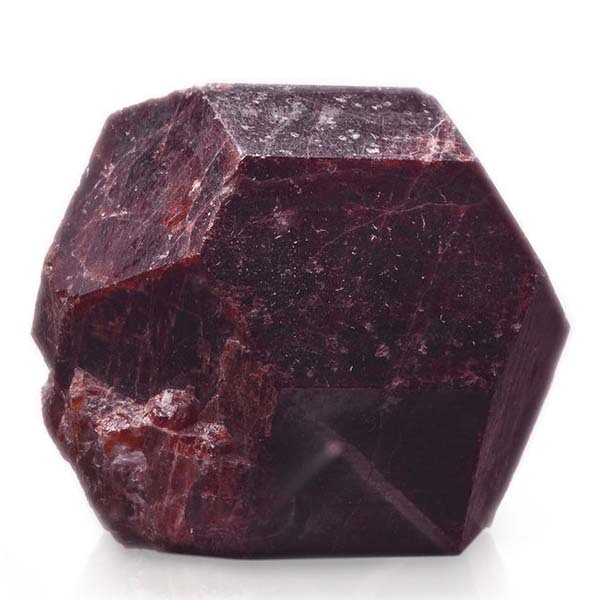 While some feel these varieties should be looked upon as different minerals, the fact remains that without exception, all garnets possess the same structure, and they are ALL in the cubic crystal system. In addition, no matter the color, all are formed during the formation of crystalline slates or other metamorphic rocks. All Garnets are in the mineral class of island silicates. Even in the variation of their formations, three laws are always followed. Each is made of two-valency metal ions, three-valency metal ions and the island silicate modules, and always in the ratio of 3:2:3. The addition of a 4th element like iron or aluminum provides the color (green through pink from aluminum, brown to black from iron). Garnet can be worn as necklaces, pendants, used as hand comforters or laid directly on an afflicted part of the body. In all cases, direct contact with the skin provides the best benefits. Garnet helps in situations with no way out. It is the stone of crises. Throughout history it has always been in fashion in times of crises, and helps you to cope with and overcome everyday problems in extreme situations. It fortifies your inner flame and the desire for self-realization. Garnet promotes self-confidence, strength of character and the love of life. It bestows courage, hope, trust and obstacles are seen as challenges that have to be dealt with. In difficult situations, Garnet provides endurance that will surprise its wearer. It aids in eliminating unnecessary inhibitions and taboos, ensures active, balanced sexuality and helps with potency problems. Garnet helps us say goodbye to unusable or worn out ideas and views. It dissolves behavior patterns and habits that hinder us from achieving a free lifestyle. Garnet also brings a wealth of new ideas and the dynamic to realize them in spite of our resistance or conscious sabotage. Garnet fortifies the power of regeneration in the body. It eliminates blocks, stimulates the metabolism and harmonizes the composition of body fluids (particularly the blood). Garnet stabilizes circulation and fortifies the immune system, encourages the absorption of nutrients in the intestines and accelerates the healing of inner and external wounds. Garnet has special affinities with Aquarius, Leo, Aries, Scorpio and Capricorn. Its Energy is Projective, its Planet is Mars, and its Element is Fire. It aids the professions involved with Communication (especially radio and TV) and those who choose to be homemakers. During the Middle Ages, warriors placed Garnets into their shields and sword handles believing they would protect them from injury in battle. Garnet amulets were also worn to bring luck, wealth and blessings. During the same time period, it was also thought that Garnet illuminated a darkened soul by bringing light and hope at the spiritual level to situations in life that seemed to have no end. Throughout man's history Garnets have been a healing stone. Square cut Garnets help bring about business opportunities and filter out concerns that are not one's own, and rectangle shapes have been known to aid in matters of intellect or 'earthly' matters.